WatchList is a bimonthly email list of stolen bikes that is sent out to participating bike shops, enthusiasts, and resellers. It contains listings and photographs of all the stolen bikes in a certain city, state, or zipcode. 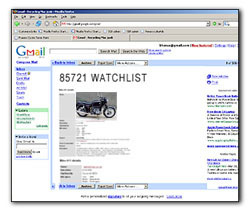 Watchlist is intended to act as a quick visual reference for people on the lookout for stolen bikes. Bike shops, biking enthusiasts, pawn shops, resellers - anyone who comes into contact with a lot of bikes. Anybody who wants to sign up for Watchlist and help people recover their bikes is welcome to subscribe. Why isn't it active yet? This site launched in late March 2005, and until there are about 500 bikes in the database, it doesn't really make sense to release WatchList. Right now I'm still running a PR campaing about the site, so when there's a decent amount of bikes listed, I will activate WatchList.